A great number of people suffer from common food allergies. Research shows that approximately 1.5% of U.S. Adults and 6% of all children under the age of three are affected by these allergies. The FDA has initiated laws that mandate if a product contains one of the eight most common foods causing allergies, it must be noted on the label. These eight most common food allergies are milk, eggs, fish, wheat, tree nuts, peanuts, soybeans and shellfish. Ninety percent of all common food allergies involve proteins from these eight foods. People most susceptible to common food allergies are those who have a family history of hay fever, asthma, or eczema. An allergy is an immune system response to what it perceives as a threat to the body. This is actually a malfunction of the immune system. With common food allergies, the invader is a protein of the food group in question–the immune system responds by producing the immunoglobulin E (IgE) antibody. Swelling, hives, sniffling, wheezing, gastro-intestinal problems such as diarrhea, and cramps are among the reactions to a food allergy. Within the first half hour the possibility exists for the person to have such a bad allergic reaction (anaphylaxis) that airways are constricted, blood pressure is dramatically lowered and suffocation is caused by the swelling of the throat, causing death. Most common food allergies are diagnosed by a skin or blood test. The skin is pricked and exposed to the food protein in question, and if a bump or hive develops on the spot the allergy is confirmed. A blood test, when taken immediately after am allergic reaction, can reveal the presence of the immunoglobulin IgE antibody, also confirming diagnosis. The treatment for all of the most common food allergies is a diet free of the food and any products containing the food. Soy, dairy, and peanut allergies are the most common food allergies in children and may disappear as the child grows older. A food allergy that strikes an adult is there for life. Sometimes common food allergies are confused with an intolerance for the food which, while it may produce some of the same symptoms, does not involve the body’s immune system and cannot cause death. The most common allergies for adults are shellfish (lobster, crabs, shrimp, etc. ), peanuts, tree nuts, fish and eggs. The FDA is currently working with food manufacturers to make labeling even more specific, because some foods such as gluten, wheat, corn and others can appear in an ingredients list under several other names. Oils from peanuts, soybeans, sunflower seeds, sesame seeds, corn. Sulfites and other food preservatives allergies. MSG (monosodium glutamate) and other food seasonings allergies. Tingling sensation in the mouth. For food allergies, medical testing is vital to pinpoint which foods to avoid. Food allergy testing may include blood count and several other blood tests, including the IgE allergy antibody; nasal smear, pulmonary function study, chest and sinus X-rays, plus a detailed symptomatic medical history and food diary review. As many 120 substances may be used in puncture (pin prick) testing on the upper back and arms to pinpoint exactly which food allergies affect you. Intradermal tests of substances on the arms and dermatitis patch tests may be used as well, based on the puncture test results. Medical testing can also determine other allergens that are causing allergic reactions. For severe food allergies, your physician may prescribe a portable emergency adrenaline injection. Keep a food diary of your eating habits and food allergy symptoms. Read food labels carefully. Once specific food allergies have been identified, reading food labels can reduce exposure. However, many processed foods have hidden ingredients that can trigger a food allergy flare-up. 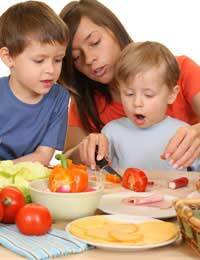 Dietary Avoidance: Avoiding the offending allergen in the diet is the primary treatment of food allergy. Once a food to which the patient is sensitive has been identified, the food must be removed from the diet. To do this, patients need to read lengthy, detailed lists of ingredients on the label for each food they consider eating. Treating an Anaphylactic Reaction: Patients with severe food allergies must be prepared to treat an anaphylactic reaction. Even those who know a lot about their own allergies can either make an error or be served food that does not comply with their instructions. To protect themselves, people who have had anaphylactic reactions to a food should wear medical alert bracelets or necklaces stating that they have a food allergy and that they are subject to severe reactions. Treating other Symptoms of Food Allergy: Several medications are available for treating the other symptoms of food allergy. For example, antihistamines can relieve gastrointestinal symptoms, hives, sneezing, and a runny nose. Bronchodilators can relieve the symptoms of asthma. These medications are taken after a person inadvertently has ingested a food to which he is allergic. They are not effective, however, in preventing an allergic reaction when taken prior to eating the food. In fact, no medication in any form is available to reliably prevent an allergic reaction to a certain food before eating that food.